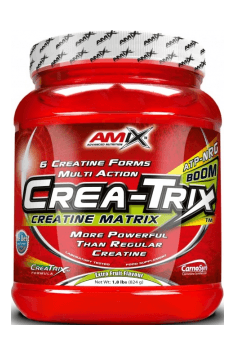 Mix 1 scoop (20,6 g) of Crea-Trix™ with 200-300 ml of water or juice and drink immediately. Use approx. 30-60 minutes before training. Athletes using Crea-Trix™ should consume adequate amounts of water to maximize hydration and enhance metabolic functions. 1 portion of the product between meals. In the light of the most recent studies, there is no need to divide creatine supplementation into cycles – it may be constantly applied without the loss of the supplement’s effectiveness or any other side-effects. However, remember about increased water supply during taking creatine. To maximize effort abilities, it will be optimal to take a portion of a supplement before a training session with caffeine. PPAR activation product. It helps to improve muscle strength, significantly delays the onset of fatigue. Advanced anabolic supplement based on three patented formulas. A natural preparation containing substances that may enhance building of muscle mass. Supports the synthesis of muscle proteins; does not show androgenic effects; does not block the HPTA system. MicronTec Micronised Creatine Monohydrate – a technologically advanced form of creatine monohydrate, the king of dietary supplements. Owing to maximum micronisation of the product, the active substance has better solubility and absorption. Because of that, it is a perfect solution for individuals looking for a high-quality nutritional supplement based on one of the most thoroughly tested ingredients. Creatine owes its popularity due to its great effectiveness and safety of use. As a substrate in one of the main energy pathways in the body, its supplementation is a direct way to increase the body’s physical performance. Consequently, this helps provide stronger training stimuli. Because of that, creatine allows you to achieve the desired goals in a shorter period of time. Creatine is valued also due to its great anabolic potential. It arises not only from to its ability to increase physical capacity but also direct impact on hypertrophy. Creatine inhibits the activity of myostatins which are factors that inhibit muscle growth. This helps speed up anabolic metabolism. What is more, creatine shows the ability to promote the hydration of muscle tissue. As a result, there is an increase in sarcoplasm concentrations in myocytes which leads to a more optimum biochemical enviroment and thus improved processes of muscle regeneration and development. Dicalcium phosphate - a combination of phosphorus and calcium (classified as macronutrients) in a single molecule. Calcium is the building substance of bones, teeth and activator of enzymes, including ATP-ers release ATP energy. It affects the blood clotting and muscle-nerve conduction. Phosphorus, besides a common feature with calcium- the bone structure, conditioning their development and normal condition, and also affects the formation of nucleic acids and brain tissue. It stimulates the acid-base. It participates in the processes of energy (phosphorylation) and phosphocreatine synthesis. Calcium phosphate is used in supplementation, as the ingredient of mineralizing, vitamin-mineral and pre- and post-workout supplements. Dipotassium phosphate a combination of phosphorus and potassium (classified as macronutrients) in one molecule. Potassium affects cell volume (level of hydration) and provides the proper acid-base balance. In the cellular system and the circulatory system it is a calcium antagonist. Phosphorus is the building substance of bones and guarantee their proper functioning, causes the development of nucleic acids and brain tissue, and it is involved in the phosphorylation process. Involved in the synthesis of high energy compounds. Part of mineral, vitamin-mineralizing and pre- and post-workout supplements. Dosage: Up to a few grams per day, depending on the individual needs of the body and the size of the losses incurred during exercise.